There are many ways to interpret tarot cards and how they are interpreted often depends on the context of the tarot reading. Sometimes the card represents a part of yourself while other times it represents an important person in your life. The queen of swords is no exception. Having her in your tarot spread can point to both a hidden aspect of yourself or someone in your life. Before we dive into how to interpret the queen of swords, let us look at how she is usually depicted. The strong and subtle queen is shown in profile sitting on a stone throne. In one hand she holds a sword that is facing upward and her other hand is outstretched with her palm facing upward. The sky above the queen is clear and blue with one single bird soaring above her head. She has a golden crown upon her head and is dressed in white robes. It is often believed that the queen of swords represents a woman in your life or the feminine energy you posses. This person or energy is considered both powerful and inviting. Her open hand seems to beckon someone to come toward her while her sword represents her power and strength. The clear blue sky above the queen indicates the clarity of mind that the queen has. She is able to see things as they are and offer others her insight, wisdom, and maturity. The bird soaring above the queen's head represents her ability to soar above daily challenges and use her clarity of mind to find meaningful solutions. Additionally the robe and crown that the queen wears indicate her importance. She is not someone who can be overlooked or forgotten. When the queen appears in your life she is important and impactful. When the queen shows herself reversed it often indicates that you are thinking with your heart or intuition rather than with a clear mind. It might mean that there is something happening in your life or with someone important to you that is making you emotional. While it can be helpful to use your heart in decision making, sometimes you need to rely on your mind. It is also possible that the reversed queen can indicate that relying too much on cold intellect has created an imbalance. Having her upside down may mean that she has been devoid of emotion when trying to get to the bottom of an issues. This can cause its own difficulties and problems. When this is the case it indicates that you need to remember the outstretched hand of compassion. When the queen of swords shows up in a love reading it indicates that you need to rely on someone who is clear seeing and powerful. It might mean that you need to search inside yourself for these qualities so that you can be both compassionate and decisive. It could also mean that you should turn to someone your trust for love advice who has the clarity of mind you need to help you make the best decision. If you are learning how to read tarot you will come across many different interpretations of what this queen means when she shows up in a reading. This is because it can indicate so many different things depending on who the reading is for. Sometimes for men and lesbian women it is thought that the queen showing up in their reading means that the powerful and clear minded woman is soon to be their love interest. While for straight women it is thought to represent a part of themselves. Whatever the case may be, it it is clear that when the queen of swords is in a love reading it is a good sign. It indicates a sense of hope that someones love life is soon to become even more clear and compassionate. When asking questions in a tarot reading some cards lean toward a yes answer while other cards lean toward no. 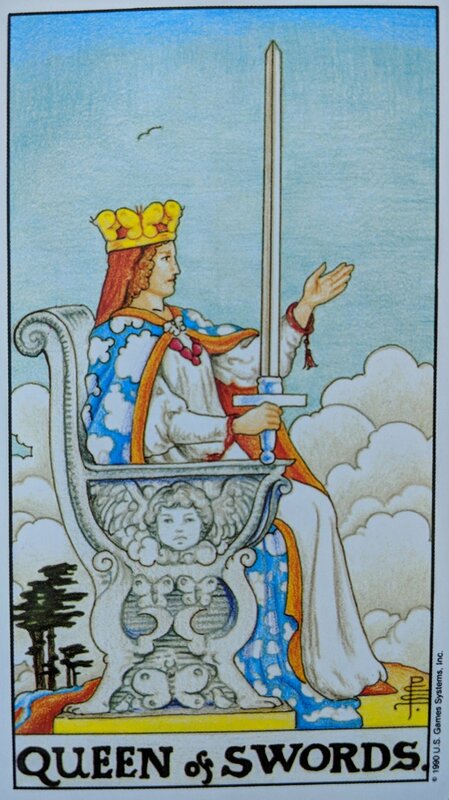 The queen of swords is certainly a card that leans toward yes. With her power, clear seeing, and inviting nature she indicates a yes to the questions you might be asking. Newer PostPsychic Source Reviews - Is Psychic Source Legit?